I read this issue of BLUE BOOK about ten years ago, and it's a good one, as usual. 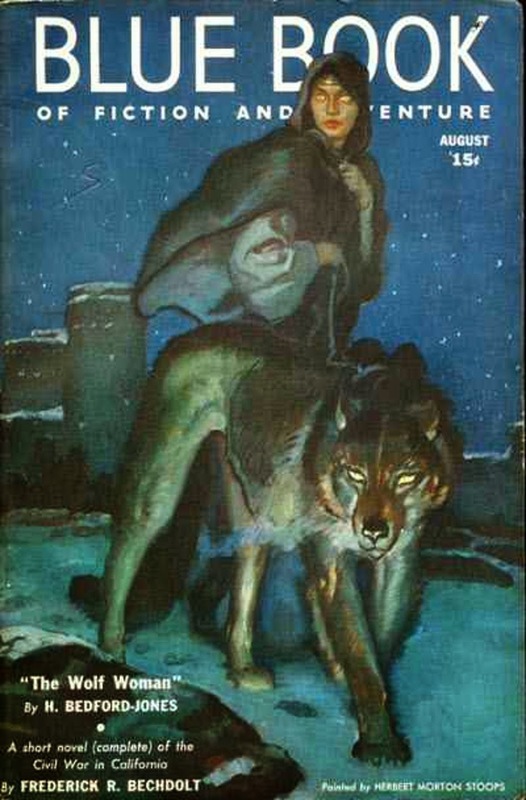 Leading off with a cover by Herbert Morton Stoops, it has one of H. Bedford-Jones's "Trumpets From Oblivion" stories, a great series that tells the real story behind various myths and legends; a "Ships and Men" story by Bedford-Jones and Captain L.B. Williams (a fictional "collaborator" to give the stories more of an appearance of authenticity); a "Men in the Air" story by Michael Gallister, who was also really H. Bedford-Jones (there's a story about how HB-J had several typewriters in his office and would move from machine to machine to write four or five stories at once; I think I believe it); and stories by Robert Ormond Case, Frederick Bechdolt, Fulton T. Grant, Robert R. Mill, and Beatrice Grimshaw, none of whom were really H. Bedford-Jones, as far as I know. That is a really cool cover. I don't remember seeing blue used very often on pulp magazines. That's a particularly good cover by Stoops, whose work I tend to think of as being less detailed and more impressionistic than this. I don't think I've ever seen this issue before. I wouldn't mind reading the story by Frederick Bechdolt, as I've been impressed by others that he wrote. what's amazing is that his five stories all came out so well-written and detailed. It almost seems impossible, but he did it year after year! He Stoops to Conquer! I've been seeing that BLUEBOOK cover in fantasy/sf contexts for years. Except for the ERB issues Bluebook doesn't seem to get much respect among collectors. But that's a good thing as it is one of my favorite pulps, so the 1930's issue are more affordable. The 2 1950s issues I've read have been impressive (and handsome) as well. I've found BLUE BOOK to be one of the better fiction magazines not only in the 1920's and 1930's but also in the 1940's and early 1950's. Very impressive interior illustrations also. Except for the Burroughs issues the magazine is very affordable.